This recipe caught my eye for two reasons, 1. It features chicken and 2. It included prices for the ingredients. I was first taken aback, but hey, who isn’t on a budget now and days, right? This creamy mushroom pasta is a restaurant favorite that’s surprisingly easy to make at home. Season the chicken breasts on both sides with salt and pepper (or any other seasoning you like). Cook on a George Foreman Grill about 8 minutes per breast. Alternatively, you can cook them in a non-stick skillet over medium-high heat for about 5 minutes per side or until cooked through. Keep the chicken on a plate covered with foil until ready to eat. While the chicken is cooking, prepare the sauce. Cut the onion into a small dice and mince the garlic. Cook them in a large skillet over medium heat with olive oil. Cook about two minutes or until the onion is transparent. Add the sliced mushrooms and a dash of salt and cook until the mushrooms have completely softened and released all of their moisture (about 7 minutes). Add the 2 Tbsp of flour to the skillet. Stir and cook for about 2 minutes. It will coat the mushrooms and will begin to turn golden in color. Just make sure to keep stirring so that the flour does not burn. Combine the chicken base and water to make a chicken broth. Add it to the skillet along with the white wine and thyme. Whisk until no flour lumps remain. Let simmer until thickened (about 3-5 minutes). While the sauce is simmering, get a large pot of water boiling for the pasta. Cook the pasta according to the directions on the box (boil for 5-7 minutes or until al dente then drain). Once the sauce has thickened, turn off the heat and stir in the cream. Continue to let simmer until reduced in volume and thickened. Give the sauce a taste and season with salt and pepper. Roughly chop the parsley and stir it in with the drained pasta. Grate about 2 ounces of parmesan over top (or top each serving individually). 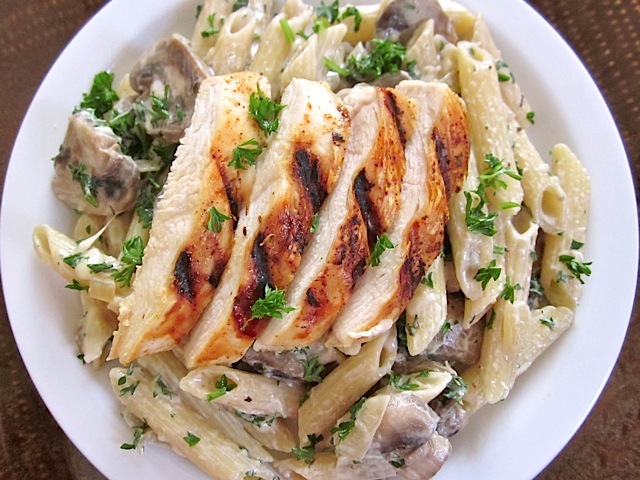 Slice the chicken and serve each bowl of pasta with a few slices of chicken.